Do you know what GamingApp Search Extension is? GamingApp Search Extension is not an application that you can trust entirely. In fact, malware experts at Spyware-Techie.com have classified as one more browser hijacker. Such classification has been made for a number of reasons. One of them is its invasive functionality. It has been discovered that it can easily make intrusive changes to your browser's default settings without any notification or authorization. Unfortunately, alterations will have a negative effect on the way you experience the web. It is also important to note that this hijacker could prove to be the primary reason other suspicious programs could enter your operating system. It should be self-evident that you must remove GamingApp Search Extension at the very same instance that it is found active on your PC. In this article, you will find further information regarding this application's functionality along with its detailed removal guide. As mentioned, there is more to GamingApp Search Extension than meets the eye. Further analysis has revealed that in some instances this hijacker could be distributed via bundled installers, which are dangerous because they tend to host questionable and even harmful applications. Thus, if you already have this malware running on your PC, we recommend analyzing your operating system for other suspicious software. Furthermore, you should know that in some situations using the newly appointed search engine could prove to be dangerous. Our researchers have noticed that in some cases you could come across modified results, which might host redirect links. That is an incredibly dangerous instance because just clicking on such result could lead you to harmful sites. You could end up on a web page that host malicious software, and in some instances entering it could be enough to infect your PC. In other situations, you could encounter fake online stores, which malware developers use for a simple reason - to steal your credit card details and other sensitive information. As you can see, this intrusive application might prove to be quite dangerous. Do not take any chances and conduct a complete removal of GamingApp Search Extension right away. The removal of GamingApp Search Extension is essential. Make sure not to leave this hijacker up and running on your operating system since it could lead to further virtual security problems. 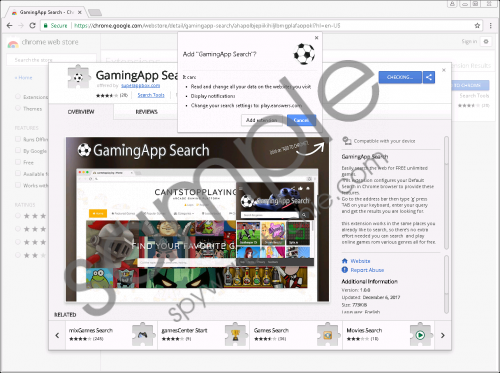 If after you are done with the instructions below, the invasive change of your search engine is still in place, it could be an indication that traces of GamingApp Search Extension are active on your PC. In other instances of incomplete removal, this browser hijacker could be restored with the help of just a few leftovers. Therefore, our research team advises you to double-check your entire operating system for anything associated with this hijacker once you are done with the instructions below. By doing so, you will be sure that the termination has been successful. b) C:\Users\(your username)\Local Settings\Application Data\Google\Chrome\User Data\Default\Extensions. b) C:\Users\(your username)\Local Settings\Application Data\Google\Chrome\User Data\Default. The removal of this browser hijacker must be performed without any hesitation. However, we are well aware that some user might not feel comfortable executing manual termination on their own. If you are one of those users, there is nothing to worry about. Below you will find an alternative removal guide. Follow these instructions and you will be able to delete GamingApp Search Extension automatically. Tags: delete GamingApp Search Extension, GamingApp Search Extension, remove GamingApp Search Extension.